Stephen Black gives remarks following leadership award presentation. 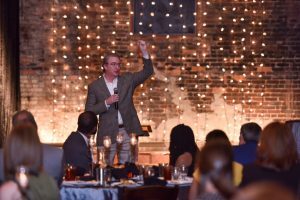 TUSCALOOSA, Ala. — The Alabama chapter of The Albert Schweitzer Fellowship recently presented the Schweitzer Leadership Award to Stephen Black, founder and director of the Center for Ethics and Social Responsibility at The University of Alabama. Black was cited by the fellowship for his work enabling thousands of undergraduate and graduate students to serve as effective, engaged and ethical citizens, assisting them to develop a moral and civic maturity. The UA Center’s programs have enabled students to provide free vision screenings and tax assistance to poor families and individuals across the country since 2006. 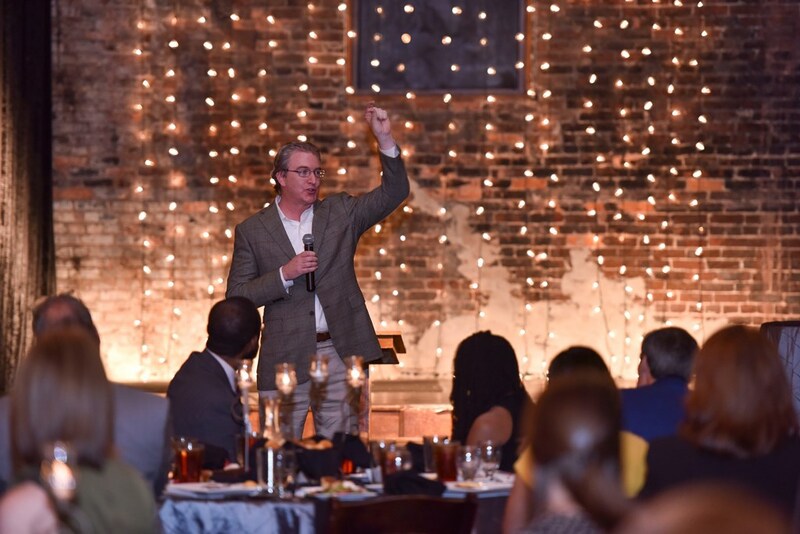 Black received his award at the recent Alabama Schweitzer Fellowship program’s annual Celebration of Service dinner, held at B&A Warehouse in Birmingham. Black studied law at Yale University and has directed the UA Center since 2005. Prior to that, he served as an assistant to the state’s governor, where his work focused on policy and economic development. The Alabama Schweitzer program is housed in the University of Alabama School of Medicine and operates with support from the University of Alabama at Birmingham schools of Dentistry, Health Professions, Nursing and Public Health. It is one of 16 such programs throughout the United States and in Lambaréné, Gabon, at the site of the Albert Schweitzer Hospital.